Thorn Ma, who is a grandmother of Samna, a pre-school student, thinks that the pre-school is very good because the children learn the alphabet and numbers, they are happy playing with each other, and so they are better prepared for Grade 1 school. They are less likely to drop out of school than students who have not gone to pre-school. The pre-school is near to the village so is easy to get to, and while the children are at the pre-school for two hours a day, mothers have time to do other things. This story and photo record was given approval by Thorn Ma for CCAFO media. From right to left, Ms. Rosemary Hurley (volunteer), Grandma Thorn Ma and Samna (preschool student-granddaughter). This photo was taken during the interview at CCAFO Preykralar Khangkloeut Village Based Preschool during the first week of April 2014. Photo by Hing Channarith. Sok Reaksa is 4 years old (April 2014) and has lived with her grandmother since she was five months’ old, because her parents left the area to work in Mondulkiri Province, North-Eastern province in Cambodia . They do not send much money back to the grandmother, so it is difficult to support Sok Reaksa, but the grandmother has made a fish-trap to earn some income for her and Reakasa daily living. 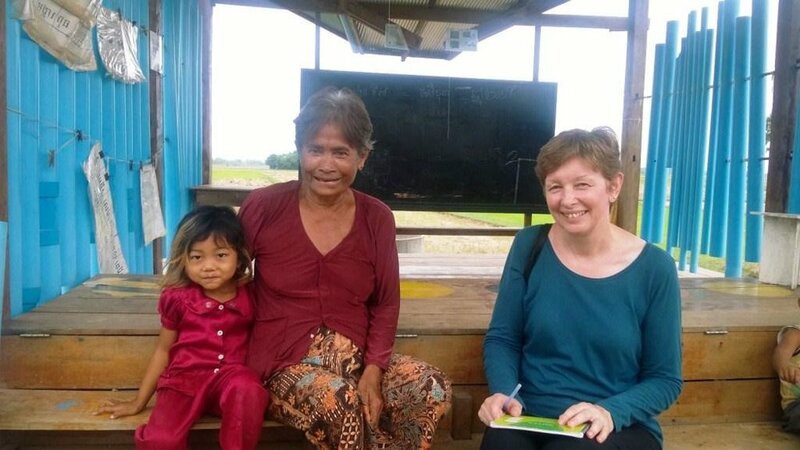 Sok Reaksa joined the CCAFO Trapeang Kdol Village Based Pre-school when it opened in 2013, but she has some health problems and cannot stay for all the classes. The school is a 15 minute walk away from home. Sok Reaksa would like to do a medical job when she become adult. This story was given approval of Pa Eoun for CCAFO media publicity purpose on its website/FaceBook or report. Photo: Pa Eoun who is grandmother of Sok Raksa while she was sharing about Sok Raksa.